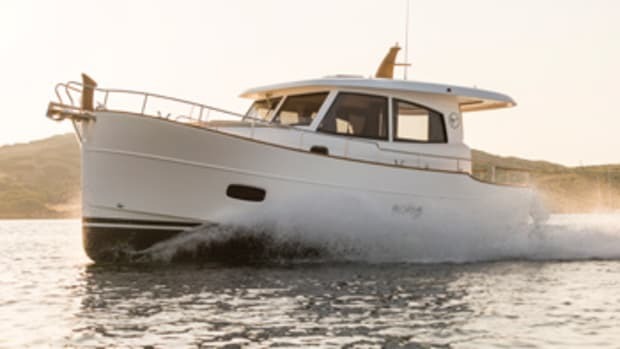 Rampage Sport Fishing Yachts has built its first open cockpit express fishing boat with pod-drive propulsion — the 34 IPS, named after the Volvo Penta Inboard Performance System. 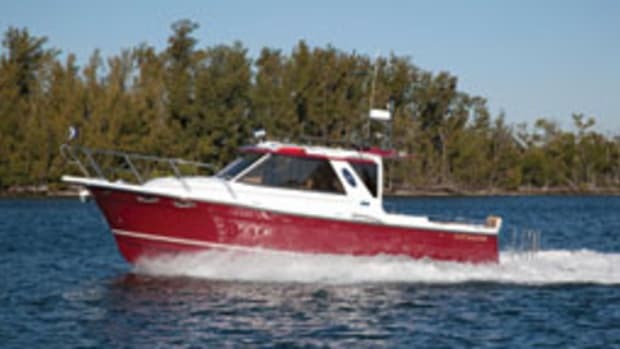 The Rampage 34 IPS is the sixth model in the Oconto, Wis., builder’s fleet, which includes express boats from 30 to 41 feet and a 45-foot convertible. Rampage will continue to offer its 34 Express with conventional inboard propulsion, according to Tony Martens, director of product development and engineering. “The fishing-boat community is more conservative,” says Martens. 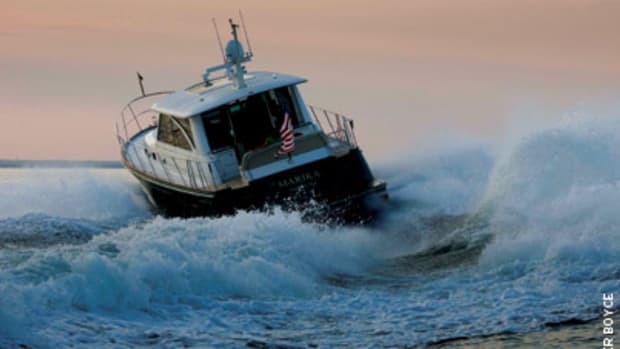 “We want to make sure that we still offer for the traditionalist fishermen a boat powered with conventional inboards.” The 34 Express can be powered with twin Crusader gas inboards or Caterpillar C7 diesels (460 hp). There are also two options for the IPS diesel-powered 34 — twin IPS 500s, which are rated at 370 hp, or IPS 600s, rated at 435 hp. With the IPS 500s, the Rampage 34’s fuel efficiency will increase from 5 to 10 percent compared to the Cat-powered 34, according to Martens. The boat cruises from 26 to 30 mph and tops out at nearly 38 mph. You’ll get roughly 1.1 miles to the gallon while running at 30 mph, and with its 400-gallon fuel capacity, the boat has a range of 400 miles. In addition to improved performance, the IPS’s joystick steering will improve low-speed maneuverability, says Martens. 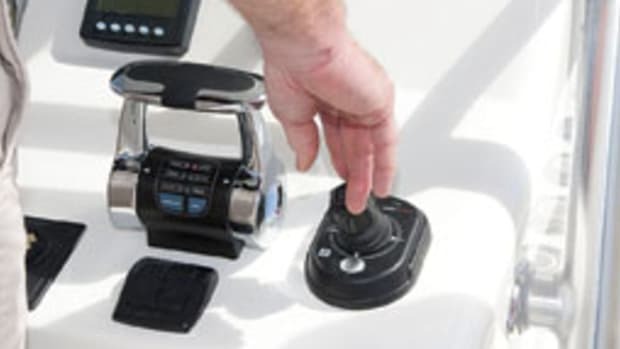 The builder is particularly excited about the propulsion system’s Sport Fish Mode, which positions the drives outward at their maximum for increased torque to execute quick maneuvers while chasing fish. To accept IPS, the 34 had to undergo significant design changes below the waterline, including the addition of tunnels for the forward-facing drives, says Martens. But the features and design on deck and in the cabin remain essentially the same. On the bridge deck, an L-shaped companion settee is to port of the centerline helm station. The console has enough room for two 12-inch electronics displays, and grab rails are well-placed — on the port side of the companionway and forward of the companion settee. The cabin, accessed via the companionway forward of the starboard seat, includes the necessities for overnighting. There’s 6 feet, 6 inches of headroom, and the head, to port, has a hand-held shower and vanity with stainless-steel sink. The galley, just forward of the head, comes with a two-burner ceramic cooktop, microwave oven, refrigerator/freezer, and stainless sink. The forward dinette converts to four upper and lower berths or two berths above with a full-size berth below — plenty of room for the crew to crash. 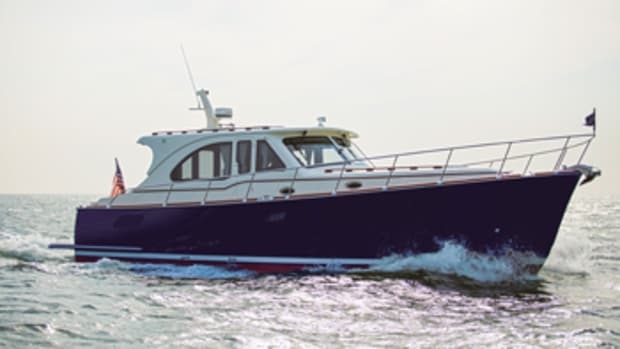 The 34 IPS is also available with a forward island berth design. The settee across from the galley converts to a full two-person berth, as well. Standard fishing equipment includes an insulated fishbox with macerator pump, six stainless-steel rod holders, and a half-inch-thick aluminum plate in the cockpit sole for a fighting chair. All hardware is overbuilt, including the transom door latch. Fresh- and raw-water washdowns are also standard. Rampage builds the 34 with stitched fiberglass fabrics, polyester resin and a skincoat of vinylester resin for protection from osmotic blistering. (The gelcoat warranty is three years.) The bottom is solid glass, while the sides are cored for weight savings. The builder backs away the core material in through-hull areas to prevent water penetration into the core. 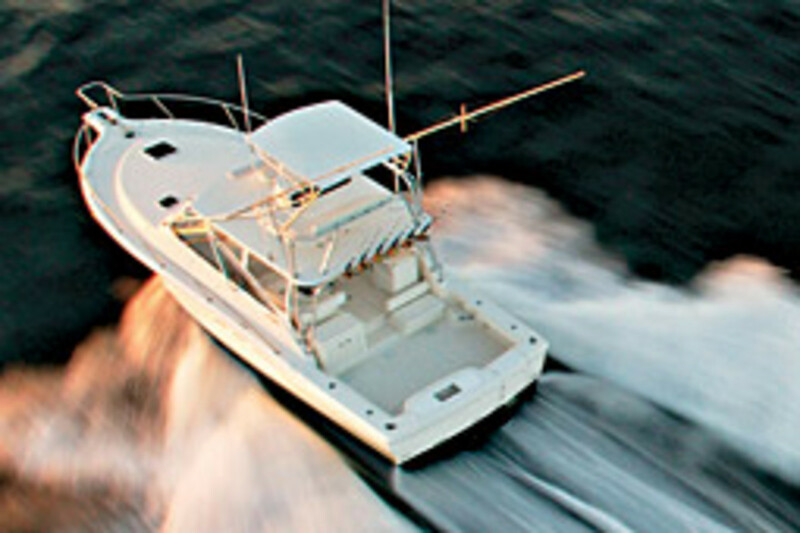 The hull caries a 5-year warranty. The IPS 34’s base price with the IPS 500s is $417,253. Multiple options are available, including a hardtop/tuna tower with six rocket-launchers, two spreader lights and red and white courtesy lights ($25,467). Rampage is considering redesigning other models to accept IPS, but the company declined to provide further information. 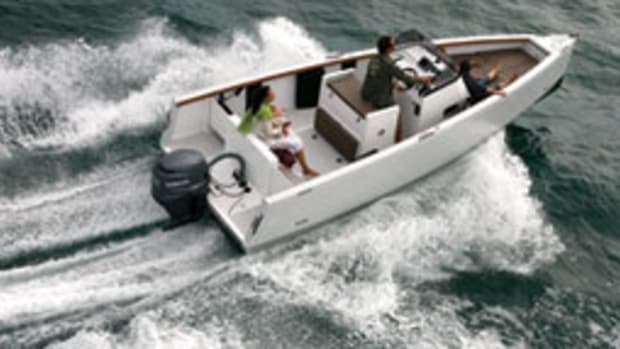 CONTACT: Rampage Sport Fishing Yachts, Oconto, Wis.
Click here to find more Rampage Sport Fishing Yachts. 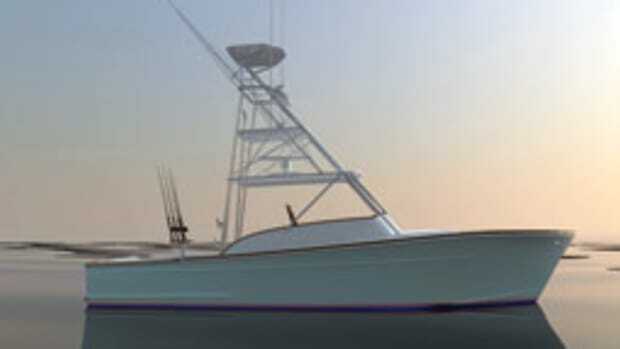 The Islander 34 is the launch model for the Americas. It’s a salty-looking boat with a steep plumb bow, accentuated bow flare and a rounded stern.